Her and boyfriend Jason Trawick have been vacationing in Hawaii for almost a week now, and they’ve been having quite the romantic time! There are numerous pictures of them holding hands, smiling, kissing and playing the ocean together. Britney fans are really exciting for her because she seems more happy than ever! I’m glad to see that Jason took her out on a boat far away from land, keeping his treasure safe from the pirates that lurk! Lindsay Blames Britney for Becoming a Druggie! Wait til’ Britney Spears hears about this when she gets off of the boat in Hawaii! Polamalu, Pittsburgh Steelers football player known for his long hair has turned a problem with dandruff into gold flakes. Head & Shoulders has hired Polamalu as a pitchman for their shampoo products and insured his locks in the process for $1 million with Lloyd’s of London. 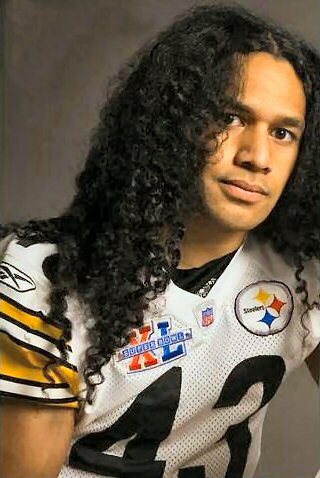 So theoretically, if Polamalu gets his hair pulled out while on the field or if he mistakes hair remover for his shampoo and comes out of the shower bald, Lloyd would have to pay up. A more likely scenario is the is just a big flakey publicity stunt. DECATUR, Ala. Crooks may want to think twice before targeting the elderly. When Ethel Jones, a 69-year-old grandmother goes to bed she puts her teeth in a glass and a pistol under her pillow. 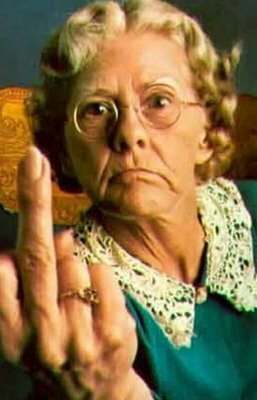 When granny was awoken by a burglar riffling through her bedroom dresser drawers she returned the favor with a direct hit to the bad guy’s stomach. Now the 18-year-old not only has a hole in him but also faces second-degree burglary when he gets out of the hospital. 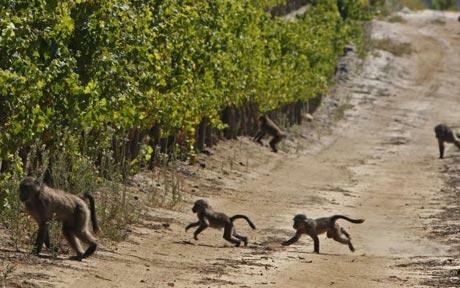 South Africa’s ancient wine country is plagued by fermented grape eating baboons. There is not much vineyard owners can do about it. The baboons swarm the grape rich land and feast on fallen, fermented grapes, many becoming so drunk, they can’t find their way home. The beasts are indigenous to the area, however, it’s man and his lust for progress that has brought them closer to humans and their prized vino bounty. Building on the baboons land has forced the thirsty wine crazed monkeys in the area and as a result they have adopted their daily happy-hour habit. It’s not only the vineyards that the baboons are raiding, it’s also homes. One family was traumatized after a gang of the sloshed monkeys broke in to their home and ransacked the kitchen looking for snacks. 20 “baboon monitors” have been employed to try and wrangle the baboons, however, their efforts do little to detour the problem. As a consequence, many families who have been in the same area for generations are simple giving up and moving away. Paris Hilton Getting Nailed with Drug Felony-Prison Next? Paris Hilton was busted in Las Vegas this weekend, with over .8 grams of cocaine that was found in her purse when she got pulled over. She originally was pulled over because cops noticed smoke coming from her windows, and a strong smell of marijuana. They found her and her boyfriend in the car-then the cocaine was found in Hilton’s purse-she claimed it “wasn’t her purse”! Paris is getting charged with a drug felony, and since it was in Nevada, she could get 1 to 4 years in prison, a possible fine of $5,000 or probation. ZOMG! Over $1 Billion Dollarzzz! Two weeks after becoming the highest grossing animated film of all time, Disney/Pixar’s Toy Story 3 will cross the $1 billion mark at the global box office today, joining Tim Burton’s “Alice in Wonderland” as the second $1 billion film this year from The Walt Disney Studios. Dear Jamie and Jason: Keep a Close Eye on Britney! Whilst Britney’s old crotch crew is getting back to their old ways, she’s in Hawaii on a peaceful vacation with her nice boyfriend Jason Trawick. She’s come such a long way since the old Hollywood gang-Paris Hilton and Lindsay Lohan, dragged Britney into their raunchy scene! I know you remember those days! How can we forget!? Back in November 2006, Britney lost control and wound up with those bad girls, and next thing you know, Britney was following Paris’ bad orders to show her crotch while exiting the car! We know it was Paris’ evil idea! The picture says it all! Finally, after these past few hectic years, Britney is now on the train of happiness and everything is going great for her! The last thing she needs is a revisited night out with the Hollywood Jailbird Club! Paris just got busted in Vegas for possession of cocaine this weekend, Lindsay just got released from jail-then rehab…and these girls don’t really give a darn. Inside sources close to Paris say that she is “shrugging off” her cocaine possession arrest. She doesn’t care because she’s got the money, lawyer and famous name to get off easy! Lindsay had just been locked away in her jail and rehab combo for over 35 days-and she’s out with her old cronies smoking cigarettes and who knows what, hanging at her old haunt-The Chateau Marmont in Hollywood! Britney’s boyfriend Jason, and even Britney’s Dad Jamie, who has a conservatorship over her still, needs to keep a close eye on her-especially NOW! Britney has a fresh new album coming out soon, an episode of Glee that she is starring in and probably a tour on the way. There is no time to get involved with the bad girls club again! Britney Spears has been on a wild roller coaster ride in life since she was a little girl. She has had so many extreme ups and downs as we all know, and we get to wondering if she will ever gain control and get on the train to real happiness. Since Britney recently signed onto the show “Glee”, where Britney will be playing herself and other actors will be playing “Britney Spears”, I think the real Britney has somehow found an all new peace in her life! Britney has been able to observe and be involved in this episode of Glee, which is all about the beginning of Britney’s career up to present day. I think because of the show’s premise, Britney is finally seeing herself for the first time. Britney has had a hard time with seeing herself because she’s always at the top. When you’re at the top, there is nothing to view above you or in front of you, because you are at the top. It’s like Glee is replaying Britney’s life right before her eyes, and the real Britney is finally understanding who she is! She’s able to take one step down, let the actors portray her life, and now Britney can see what her life has been all of these years. Hey, and she’s got to feel good about Glee making a whole episode dedicated to the life of “Britney Spears”. After the Glee shoot, I’ve been noticing Britney’s all new happiness in her recent photos. Before Britney worked on Glee, she was looking lifeless and confused-for many years! Since Britney started working on Glee a couple weeks ago and up to now, her eyes look back to life and happy! Oh and not to mention, she been making out with her boyfriend Jason Trawick like no tomorrow! They have been having a romantic vacation in Hawaii. She’s definitely happy now. Photo: Paris Hilton’s Cocaine Bust Mugshot! Paris got arrested last night for cocaine possession in Vegas as we reported here at ThecounT.com , and her mugshot has just been released into the public! Here she is lookin’ good!